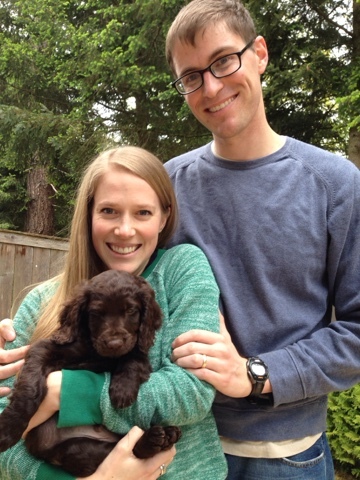 Meet the newest member of our little family: Hunley. Typical newlywed move there. Basically a requirement for your first year of marriage, right? Get married, get a puppy. Seriously we may never get anything done ever again because all I want to do is play with this boy all day long! 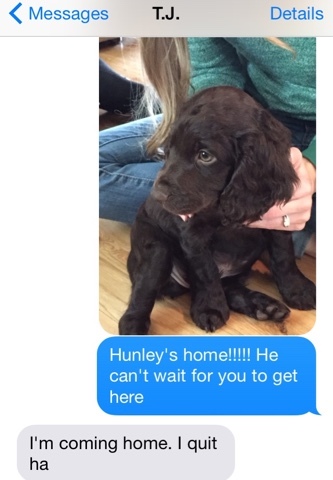 We named him Hunley after the submarine in Charleston, SC by the same name. A little homage to our roots, plus the Boykin spaniel is the state dog of South Carolina so it seemed adorable and appropriate. So far he has been such a little love, always wanting to be held and going from person to person for cuddles. But I have a feeling he's going to be a stinker once he gets more comfortable with his new home. Although... judging by this picture of my two guys below (heart melt), he already seems pretty relaxed here! So in love with our little brown dog!! how cute. good luck with him. Fun to have a boy dog in the mix. We lve his sweet heart. Cute as a button and I'm sure will provide lots of fun for you and TJ. Your new fur-baby is precious!